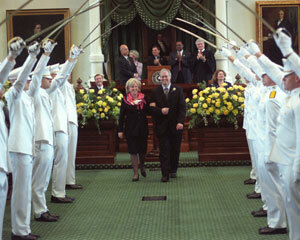 Senator Jane Nelson, R-Lewisville, was sworn in as Governor for a Day on Saturday, April 3, 2004, as part of a tradition dating back more than 40 years to honor the President Pro Tem of the Texas Senate. 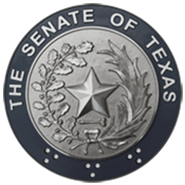 Her inauguration took place at 11 a.m. in the Senate Chamber followed by a barbecue and entertainment. Thank you so very much. What a kind introduction and what beautiful words by such dear friends. What makes today truly special is that there are so many friends and family members who are here today to join in this celebration. To you, I say "Welcome!" to our state capitol. This chamber where we are gathered is the place where 31 individuals representing 31 diverse districts come together to find solutions to the challenges facing our state.